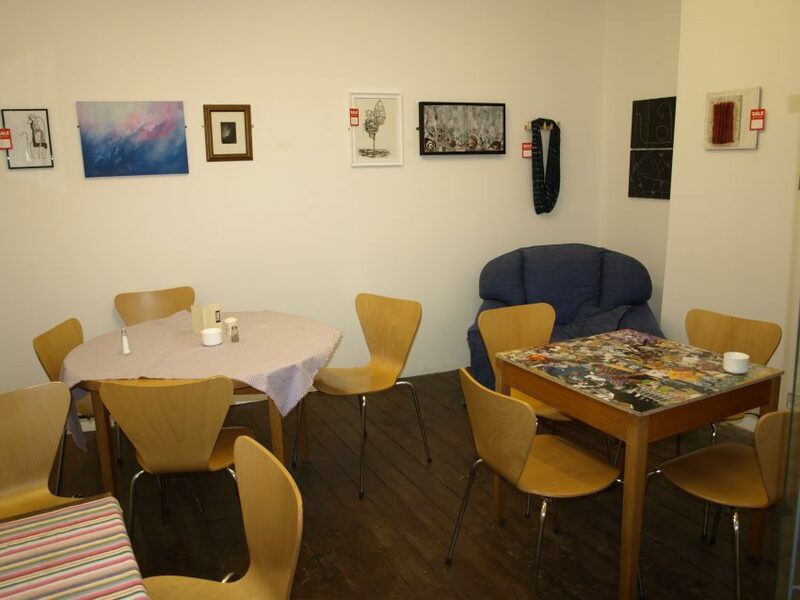 The Poetry Cafe arose out of the residencies of poets Noel Williams and Angelia Ayers and ran for many years at Bank Street Arts, initially meeting weekly and then once a month in an ever changing cafe area in the heart of the building. Those involved also participated in many other poetry related projects at BSA from readings to exhibitions, workshops to publications. The following extract is taken from the Poetry Cafe blog when the meetings relaunched in April 2011. Bank Street Arts now has a permanent (and tasty) cafe running. They call themselves Cafe Juniper, and are open throughout the normal working hours of the Arts Centre: Tues to Sat, 10-5. So Angelina and Noel are relaunching the Poetry Cafe. The Poetry Cafe is there every Wednesday afternoon, for anyone who wants to turn up. Once a month we’ll host a poetry workshop and reading group in the cafe. First workshop is Weds May 4th, 12.00 to 2.00, followed by discussion of Katharine Towers’s recent collection, The Floating Man. If you can’t make the full session, you can always come for part of it. There’s no charge, though you’ll have to pay for tea, cake etc from the cafe if you desire it (and it’s hard not to). The idea of the first session is to start with workshopping our poems: so please bring a poem for others to comment on. If you bring multiple copies, that’d be even better. Or email a copy to us and we’ll aim to print copies. We don’t know how many people there will be, probably no more than 10. If you can’t copy your poem, it won’t matter, because we’ll each read our poems out and pass them round. After the workshopping, we’d like to discuss Katharine Towers’s recent collection, The Floating Man. If you don’t have a copy, try Blackwells. Members of Bank Street get a 10% discount. You can find the title poem here.